Characteristics: Tempered glazing (10mm), use of parking, no floor guide, no aluminum frames, polycarbonate joint covers, insulation with brushes. Basic dimensions: Lower and upper horizontal profiles 54mm, aluminum track rail guide 60x53mm in size. 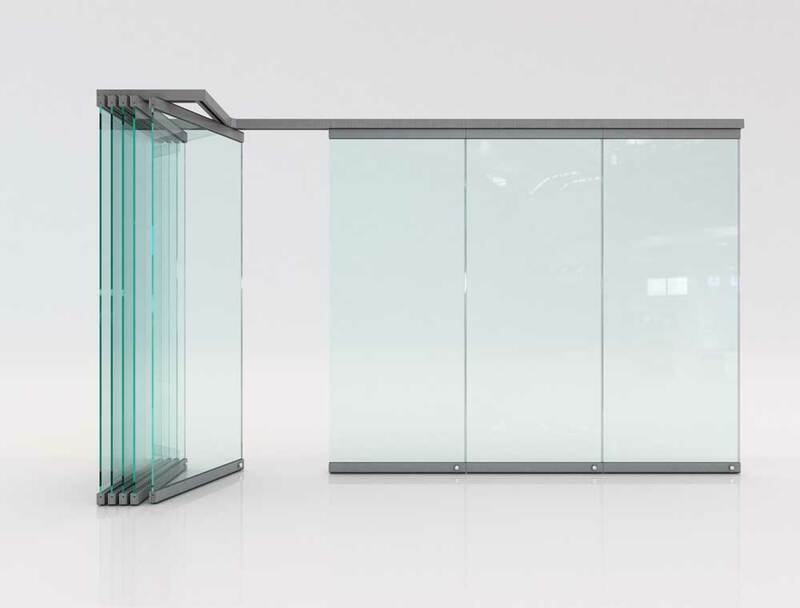 The F6 is a glass folding door system designed for spaces which need a minimalistic and elegant design at both the front and the inside of that space; without glass-board framing, its thin, elegantly designed clamps maximize the glass surface, reducing the construction cost at the same time. The F6 folding door system uses aluminum horizontal profiles clamping the top and bottom of the glass-board. Every pane is secured with lock or floor latches. The dimensions of the glazing can be adjusted considering the floor’s morphology and any other particularities of a project. Moving the panes is easy, with specially designed rollers driven by a rail guide on the ceiling; they are parked in a chosen parking area whose shape can be adjusted to any particularity. Any pane can also be turned into an opening/divertible door, or used as an entrance with the addition of a spring mechanism at the top of the panel. All aluminum profiles can be painted in a wide range of electrostatic RAL colors, anodized or made to look like stainless steel or wood. Sealing between panes is achieved with transparent polycarbonate or aluminum fitments, while sealing between the side-panes and the walls is provided by aluminum lathes bearing synthetic insulative brushes. The dimension of the cross-section of the guide is 60x53(mm), and pane size can reach 100cm in width and 250cm in height (maximum pane weight is 85kg). Every panel uses 10mm tempered glass-boards. The F6 folding door system is designed mainly for indoor spaces, relatively smaller openings, and not particularly demanding situations in terms of security, since the lower profiles are so thin that cannot accommodate the distance a latch spile needs to travel to secure or release the door. It is therefore not a recommended system for a range of applications, generally any perimetric enclosure of spaces exposed to external environment. It can however perfectly cover needs in hotels, residences, restaurants, office spaces and many more. Minimalistic aesthetics: Very small glass clamping profiles, without framing, maximized glazing coverage. Design Flexibility: Total flexibility regarding the configuration of the parking area, as well as the number and dimension of panes. Low cost: Its thin horizontal profiles considerably reduce the construction cost of this system.